Welcome to Thai Thai Restaurant. We are looking forward to serve you whether in our casual and comfortable dining room, guest pick up, or catering. Some of our Thai dishes can be quite spicy, we are more than happy to make adjustments to suit your taste at your request. Choice of chicken, beef, pork or shrimp cooked in red curry, coconut milk, tender bamboo shoots, eggplant, fresh chillies, kaffir lime leave and topped with fresh basil for an intense aromatic scent. Served with hot jasmine rice. One of the most popular Thai dish. Thai rice noodle stir-fried in pad thai sauce (light sweet and tangy), with chicken/shrimp, egg, spiced tofu, bean sprout, green onion, served with ground peanut, fresh bean sprout and a wedge of lime on the side. Smell so good and delicious. It makes Thai food well known around the world. We are glad that you visit us online. 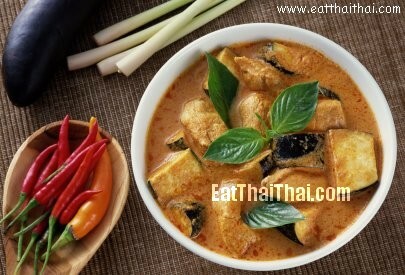 Please, stop by the restaurant and taste our authentic Thai foods during our business hours. Please, send comments, suggestions to info@eatthaithai.net. * please note an 18% service charge will be added to the bill for tables of five or more.